To create a comparable benchmark across all future Games. OGI is an indicator-based monitoring and reporting system that is grounded in the concept of sustainability. OGI uses 126 indicators to measure the economic, social, and environmental conditions of the Host City/Region/Country. There are 80 context indicators, and 46 event indicators. 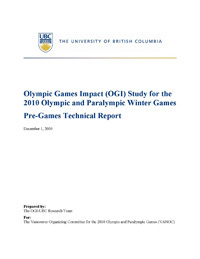 Each Games organizing committee is to present its findings in a series of four reports (baseline, pre-Games, Games-time, and post-Games) that spans 12 years, beginning two years before Host selection and ending three years after the Games. 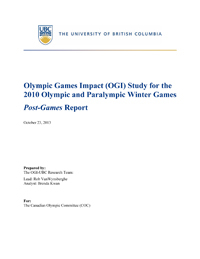 The final post-Games report, planned for 2013, will look at the long-term impact of the Games. This final report interprets indicator data over the entire reporting period (2001-2013). This report focuses on Games-time Event indicators and impacts. 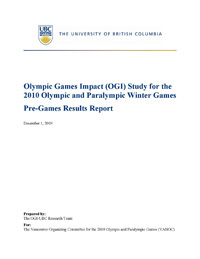 This report provides the OGI indicator results in the pre-Games period. 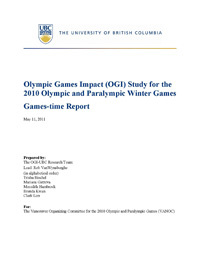 This report describes the indicators that comprise OGI. 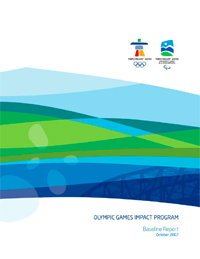 Includes measurements of the region 9 years before the Games (2001).